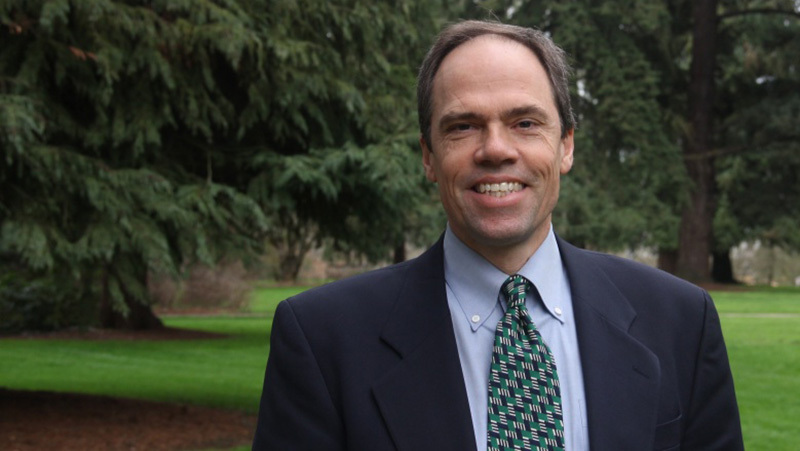 Bruce Blonigen, Philip H. Knight Professor of Social Science, will take the helm of the Lundquist College of Business beginning Aug. 1. as the current interim dean, Jim Terborg, retires after 36 years at the University of Oregon. In making the announcement, Provost Scott Coltrane lauded both Blonigen’s experience and Terborg’s accomplishments as interim dean. “I am humbled to be asked to serve in this role,” Blonigen said. “The Lundquist College of Business is an incredible asset to this university, and I have tremendous respect for the work of the faculty and the students it serves. Having had the pleasure of serving on dissertation committees alongside business school colleagues and working on complementary and overlapping research, I know first hand the great work that is being done. Terborg has served as interim dean since September and delayed his retirement by a year to continue to serve the college. Under his leadership, the college experienced a year of exceptional research productivity, earned a “#1 Green MBA” ranking from The Princeton Review, achieved re-accreditation and had a record-breaking $30 million year of fundraising. “We are delighted to send Jim off on his much-deserved retirement,” Coltrane wrote. Blonigen will continue to serve as the chair of the search committee working to find a permanent dean for the college. “The last 36 years have been an incredible time at the University of Oregon, and I could not be more proud of all that we have accomplished," Terborg said. "I look forward to watching this college continue to change the world,” he said.